A fabulous comprehensive collection of Tolkien's major works, published by Harper Collins over the last few years. 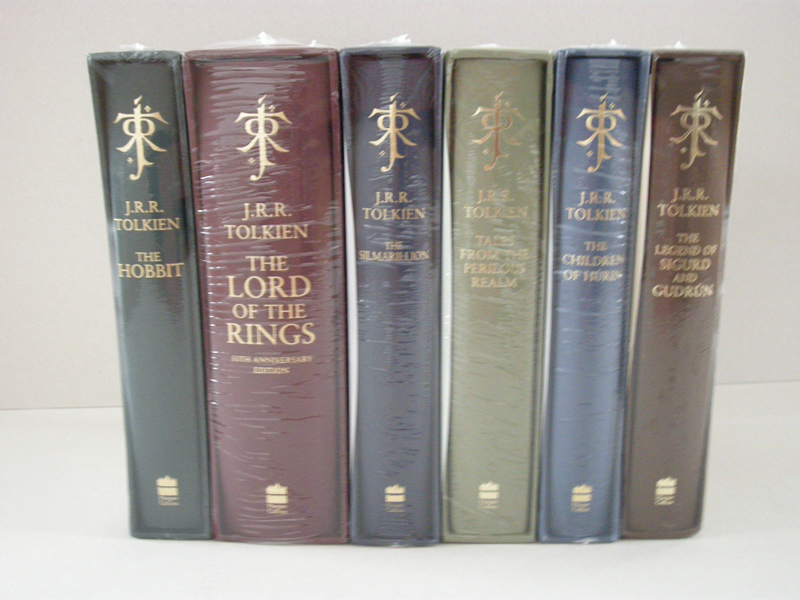 This collection features all six of their 21st Century Deluxe Slipcased Editions. 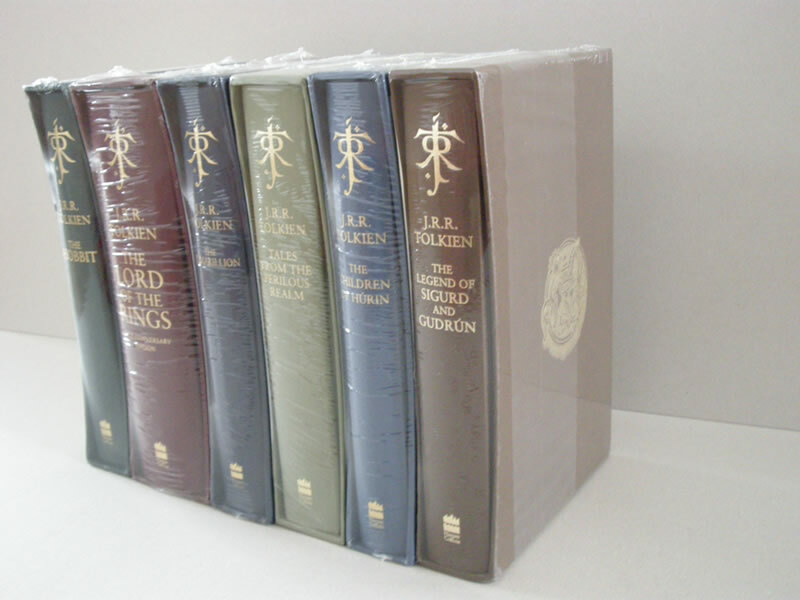 included is the 2004 Harper Collins 50th Anniversary Deluxe Slipcased Edition of The Lord of the Rings, which features the pages from the Book of Mazarbul, as illustrated by J.R.R. Tolkien, which he intended for inclusion but were not used previously. Included as well is the 2007 Harper Collins Deluxe Slipcased Edition of the Children of Hurin, which includes a ninth color plate by Alan Lee not featured inside the standard hardback. Also features the Helm of Hurin, as designed by Alan Lee, gilt stamped to the exterior. Also included is The 2007 Harper Collins 30th Anniversary Deluxe Slipcased Edition of The Silmarillion. The newly reset edition feature's Tolkien's, 'The Halls of Manwe', as the full color frontispiece, with the slipcase gilt stamped with the heraldic symbol he designed to represent Luthien. This edition also includes Christopher Tolkien's two color maps, including a fold out map of Beleriand, and as a Preface, Tolkien's original letter of 1951 containing his account of the mythology of Middle-Earth. Also included is the 2008 Tales of the Perilous Realm, a new collection that draws together for the first time Roverandom, Farmer Giles of Ham, The adventures of Tom Bombadil, Smith of Wootton Major, and Leaf by Niggle, together with the landmark essay, 'On Fairy-stories', all fully reset and corrected for this edition. Lastly included is the new The Legend of Sigurd and Gudrun, by J.R.R. Tolkien, published in the UK in 2009 by Harper Collins, the first publication of a previously unknown work by J.R.R. Tolkien, which tells the epic story of the Norse hero Sigurd the dragon slayer, the revenge of his wife, Gudrun, and the Fall of the Niflungs. Features a color frontispiece of a facsimile page from J.R.R. Tolkien's original manuscript. Quarter-bound in brown with gray boards, stamped in gold foil with a unique motif of Sigurd's horse, Grani, and housed in a matching custom slipcase. Each book and slipcase still in factory shrinkwrap. Now is your chance to order a complete set of deluxe editions in mint unread original condition!